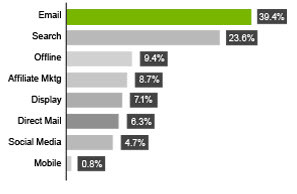 In a recent survey, marketing executives reported that email is the strongest-performing advertising channel. Behind Email was Search, Offline, Affiliate Marketing, Display, Direct Mail, Social Media and Mobile. This data is from Datran Media's 4th Annual Marketing & Media Survey, 2010. Share your thoughts on what will be the next big marketing channel. Can Social Media be number one in the future? I was interested to know more about email marketing its my one of the favorite topic please make post about relevant. n thanks for this useful stuff. Thanks for the comment Stela. I will do my best to have relevant posts. What topic is the most interesting to you?